WebCenter Content is a great tool for keeping your company’s content organized, but it can be difficult to proactively manage new, updated, and expiring content. Users check out content and forget to check it back in. Plans and policies require reviews at varying intervals. Managers change, and metadata needs to be changed for several content items. In 2005, Fishbowl launched the initial release of Subscription Notifier to help solve these problems and many more. Sold as part of Admin Suite and included in ControlCenter, Subscription Notifier has become one of our most successful products. We recently released version 5.1 of Subscription Notifier which, among other enhancements, adds a new feature to push documents from WebCenter Content to Oracle Content and Experience Cloud. Before I go over the new features, I’d like to give a quick overview of Subscription Notifier as a whole. 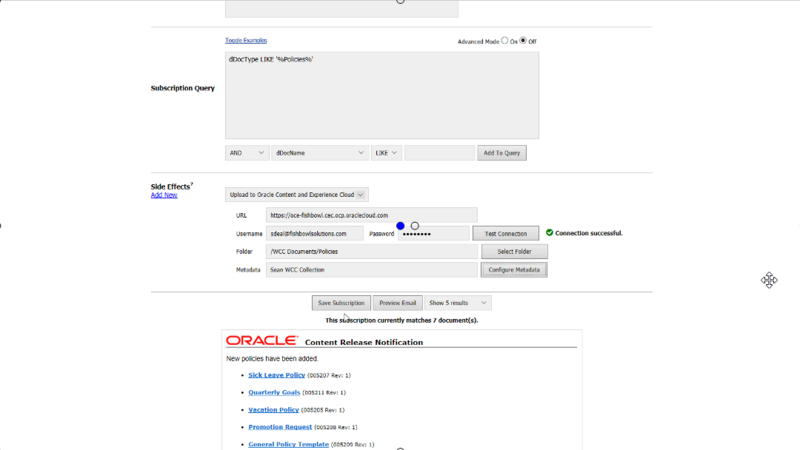 Subscription Notifier is a query-based email notification and scheduled job utility that enables proactive content management in WebCenter Content. With the easy-to-understand subscription builder, you can quickly create subscriptions based on any business rule in your content server – not just expiration. Subscriptions can be scheduled to run on an hourly, daily, weekly, monthly, or yearly basis, or run without a schedule to notify users as soon as possible. You can specify users and/or aliases to be notified, either directly by username or by using a metadata field, email address, or Idocscript. Other options are available to further customize the subscription, but the core is that simple – just specify a schedule, users, and a query, and you’re done! Non-administrator users can also be given access to create their own subscriptions in a more restricted view. Subscriptions can be set up as periodic reviews, which will put content items into the specified user’s “Documents Under Review” queue as the item’s expiration date (or any other specified date) approaches. Content remains in the queue until one of three actions are taken: “No Change Necessary”, allowing the user to update the review date without updating the content item; “Check Out and Revise”, updating the content item and its review date; or “Approve Expiration”, which lets the content item become expired. The review queue appears in both the core WebCenter UI and ControlCenter. Periodic reviews are one of the most useful features of Subscription Notifier, enabling companies to stay on top of expiring content and ensure that content is always kept up to date. Beyond notifications and reviews, Subscription Notifier can also empower data synchronization through Pre-query Actions and Side Effects. These are extra effects that are triggered either once before the query executes (Pre-query Actions) or once for every content item that matches the subscription query (Side Effects). Custom Pre-query Actions and Side Effects can be created, and Subscription Notifier comes packaged with some useful Side Effects. These include actions to update metadata, delete old revisions, update an external database, and resubmit a content item to Inbound Refinery for conversion, among others. Subscriptions don’t need to send emails – you can set up subscriptions to only trigger these actions. What’s New in Subscription Notifier 5.1? Now that I’ve gone over the core functionality of Subscription Notifier, I’d like to highlight our latest release, version 5.1, by discussing some of this release’s new features. One of the major features in this release is the ability to push documents from Oracle WebCenter Content to Oracle Content and Experience Cloud (OCE). By using this new side effect, any subscription query can be used to select documents to upload. The side effect settings give you access to your OCE documents folder structure, allowing you to choose the destination for the upload, as well as configuration for metadata based on available metadata collections in OCE. You can map metadata values from the subscription query to metadata fields in the OCE collection by using Idoc script or use string literals to set the same values for all documents in the query. Interested in seeing just how easy it is to push documents from Oracle WebCenter Content to Oracle Content and Experience Cloud? Watch this 2 minute video! Subscription Notifier has supported custom email templates for some time already, but in the past, they had to be imported through a custom WebCenter component. This meant that adding a new template or editing an existing template was not user-friendly, requiring a restart of the Content Server and digging around in the custom component directory on the server. With version 5.1, we have implemented an interface within WebCenter for adding and editing custom email templates. Not only does this make template creation more straightforward, but it also eliminates the requirement to restart the Content Server, reducing downtime and enabling easier customization. Subscriptions can be re-ordered so that they run in a specific order. This allows you to more easily make groups of subscriptions that are dependent upon side effects. Users with administrator privileges can view the documents under review for other users in WebCenter. Now administrators can more easily find out which documents are in a review and which users are assigned to them. The subscription preview window has been improved, featuring better performance for large subscriptions, an alert when the query matches duplicate items, and an option list allowing you to easily change the number of items returned in the preview. That’s not all that was added in version 5.1 of Subscription Notifier; there are more enhancements and bug fixes that I didn’t mention here. In addition to this update, we’ve also released a new version of the Fishbowl Administration component. Version 3.4 of Fishbowl Administration allows you to view the latest full release notes for Fishbowl products from the Fishbowl Component Information page in WebCenter. If you’re interested in purchasing Subscription Notifier or updating your existing copies of Subscription Notifier and Fishbowl Administration to the latest versions, please contact us for more info.